The Government has now placed before the Constitutional assembly a draft constitution consisting of a Preamble and 399 Articles arranged through 40 chapters. The structure of the draft is similar to the present constitution although the content is different. Therefore the Government’s denial that there exists no Draft Constitution is dishonest and erroneous. The Government call this Draft Constitution “A report prepared by the Panel of experts for the Steering committee which is based on the interim report, six sub-committee reports, and the report of Ad hoc sub-committee”. This so called report does not express the views of the Expert Panel except the 399 Articles of the proposed constitution. The said interim report of the steering committee dated 21 September 2017 was printed by the Government printer and was placed before the Parliament few months ago. The Draft Constitution now before the public (which the Government prefers to call it an expert report) propose the same provisions suggested in the said interim report prepared by the steering committee of which the PM is the head which propose to replace the existing Article 2 (dealing with the unitary state) and Article 9 (dealing with Buddhism). The interim report includes 8 annexures marked as 1A to 1H submitted by some of the member groups and/or political parties represented in the steering committee expressing their views to the interim report. They are the SLFP, JVP, TNA, JHU, Joint Opposition, ACMC and EPDP. In addition Dr. Jayampathi Wickramarathne P.C has submitted his views agreeing with the contents of the report. 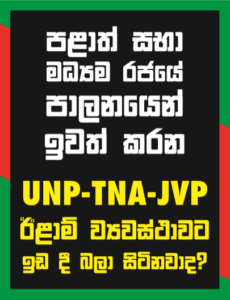 It is only the UNP that has not formally submitted their views separately for the obvious reason that it is common knowledge that Dr. Jayampathi Wickramarathne UNP national list MP drafted these proposals for the steering committee with the blessings of the PM who is the head of the steering committee. We can well understand the PM’s and his party’s reluctance to acknowledge their involvement with this draft with the mounting opposition to these proposals including that of the Mahanayakas of the three Maha Nikayas. The JVP made a public pronouncement the previous week that there is no draft constitution prepared so far. However this is now proved to be a false assertion. We are not surprised with that position when considering their conduct extending their support to the government and to the TNA in the recent past. The proposals seek to replace inter alia Article 2 & 9 of the Constitution to which the JO, SLFP & JHU has categorically opposed. The JVP does not in any way oppose the alternative provisions proposed in place of Article 2 & 9. Therefore it is clear that they are in agreement with the formula suggested in the Interim Report and in the Draft Constitution to replace Article 2 & 9. The Government is now denying that, they had any intention of changing the unitary character of the state or the place given to Buddhism. If that is their position one wonders as to why those alternative proposals to Article 2 & 9 were ever made. Obviously the attempt was to alter the existing provisions. The present Article 2 of the Constitution states in a simple sentence “The Republic of Sri Lanka is a Unitary State”. It is now proposed to change this wording to read as ‘Sri Lanka (Ceylon) is a free, sovereign, and independent Republic which is an aekiya rajyaya/orumitta nadu, consisting of the institutions of the Centre and of the provinces which shall exercise powers as laid down in the Constitution’’. The alternative proposal completely omits the word ‘unitary’ which has been interpreted time again universally including our own Supreme Court in the 13th Amendment bill determination. Supreme Court decisions are given in the English Language and it is the word ‘unitary’ that has been interpreted by Courts and other Jurists. Then why remove the very term that has been interpreted by our Supreme Court? The word ‘unitary’ is now proposed to be removed from the English text of the Constitution. Obviously this is done to deviate from the accepted interpretation given to this term. The Sinhala term ‘aekiya’ is given a new interpretation unknown to the law. The alternative proposal states ‘in this article aekiya rajyaya/orumitta nadu means a state which is undivided and indivisible and in which the power to amend the constitution or to repeal and replace the constitution, shall remain with the legislature and the people of Sri Lanka as provided in this constitution’. So we have now a new interpretation peculiar to “this article”. It is needless to say that even a federal state cannot be divided. Can the United States or India be divided? The divisibility has nothing to do with the question whether a country is unitary or federal. The power to repeal the constitution is any way with the legislature that enacted it. It is obvious that the interpretation offered is a deliberate attempt to convert Sri Lanka into a Federal state with an erroneous label attached to it. Further the introduction of the word “orumitta nadu” meaning “united” which is different from the word “ottriachchi” in the existing Tamil text of the present constitution which means “unitary”, is mischievous. It is unfortunate that the Government has dived to this depth to satisfy the TNA, the Tamil diaspora and their Western masters and sacrificing the sovereignty of the people of this country. It is shameful for a Government to stoop to this depth and sacrifice the interest of the nation in this manner. The other false representation made by the Government is that they are not going to change Article 9 which is also false. The two alternative proposals made in this Draft are different from the existing article 9. The first alternative proposal removes the word ‘Republic’ from the article so that the commitment of the state to give Buddhism the foremost place is taken away. The effect of this is that whilst Sri Lanka treats Buddhism as foremost, the state itself does not recognize so. In the 2nd alternative proposal the words “while treating all religions….. without discrimination” are added to reverse the very meaning of Article 9. This type of surreptitious tinkering and meddling with the provision is dishonest and fraudulent. These manoeuvres have taken away the trust that the people have (if any) in those who drafted these proposals. Therefore we earnestly request to remove these so called experts and the ghost writers who have produced this fraudulent document from the constitution Drafting Process, forthwith.